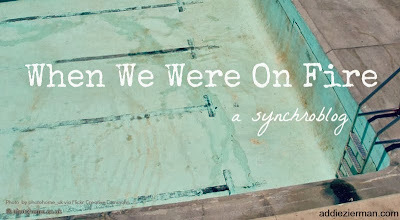 What's a synchroblog, you ask? 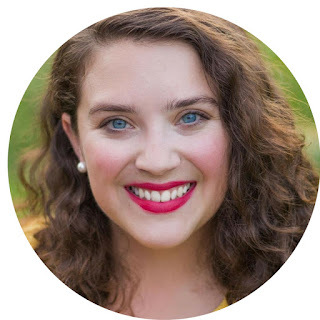 Today, MWWF linked up with Addie Zierman, the author of When We Were On Fire. She asked her readers to link up their stories of a time when they were "on fire" for God, and a moment when that fire was gone. Once upon a time I traded in my faith for a term paper. It was the spring semester of my senior year of college. My Bible as Literature class was where the exchange took place, and I thought it was a pretty good deal at the time. It was the capstone class for my English degree. And our professor–who my best friend and I called "Mosby"–challenged us to push our notions of faith and reason aside. "Come in, come in," Mosby would beckon to the class each day. "Let's talk about the Old Testament and all of the tall-tales within it." Mosby was a strident atheist, and was strict on two fronts: timeliness ("come to class on time or don't come at all," was her catchphrase), and eliminating the Christian faith from our classroom discussions. "I don't care what religious background you came from," Mosby would say to our class, holding up a disciontary-sized Oxford Bible. "Put all of that behind you–we're reading this text as fiction. As literature." These people who I had spent my whole life gleaning from became simple, flat stories. Not historical figures. Not flesh-and-blood people of real faith and real wisdom. No more real than Nancy Drew, Harriet the Spy, or Elizabeth Bennett. Life-changing people–but alive only on black and white pages of frayed books. So, it was there in the dingy, chalk-littered classroom every Monday, Wednesday and Friday that I became a rag doll Christ-follower. I was building little sand castles of faith, and my professor’s intelligent cynicism with Christianity was the tide that washed them away every morning. In order to pass the class, we each needed to leave our faith at the door. For 150 minutes a week, we were instructed to become Atheists. Become absent of faith. Absent of the tradition and belief that wove in and out of my life since its start. Since I was old enough to sing the lines of "Jesus Loves Me" and recite the Lord's prayer. I learned in the womb that Jesus loved me. I prayed to him on my first day of Kindergarten, telling him that I needed him to come with me to school as I tied my pink, glitter laces. Knowing that I’d be lonely without Him there. But, in that class, reading the Bible as literature, it was like the curtain was torn, and the walls of Jericho collapsed. The Red Sea parted and my faith dried up. My best friend, who took the class as an elective, struggled. She couldn’t write about the story about the Prodigal son, or Joseph, or Abraham, or Jacob and Essau without incorporating her understanding of what Christ had done for her in the mix. Mosby would return her papers with red ink crawling the page. Scratching out words like "Christ" and "faith." Blotting out any words or inklings of Christianity. For me, though, it was simple. I had found my stride in my English department. Writing was my power tool. And I took pride in my ability to disconnect from the faith I had grown steeped in throughout my whole life. I ruptured myself. And I began studying, absorbing what my professor spoke into me, like the bread of my very life had been made soggy from dipping it in too much wine of the world. In that class, my best friend got Cs and Ds and became a youth pastor, with a vibrant life. SHe was a good student, but couldn't bring herself to do what Mosby asked of her. She intertwined her faith in her papers, and she left school with a greater purpose, a bigger picture in mind. I got A's, because I was trapped in my professor's will. I didn’t realize that by excluding my faith from my double-spaced ramblings, I had begun the laborious task of detangling the knot of a thread that was what held me together. Before long, faith was ripped from my soul, sharply, with sting. With the sound of a million pieces of velcro and bandaids being torn apart with a quick, staccato pull. I cried, because I found myself suddently reaching, striving, yearning just to grab the hem of my Master’s robe. Just a strand, just a hint of the Savior that I used to know and love without question, hesitation or skepticism. This class had taught me how to straddle the shoreline of faith–one foot in the sea, the other in the sand. Somehow disconnecting the faith in my heart and the knowledge in my head. And just like Jacob traded his inheritance to Essau for a bowl of soup, I traded my faith for a term paper. I wrote as if I were an atheist. And I was good at it. I felt smart and strong as a result. At the end of the day when the final period was dotted on the edge of the last sentence of my term paper, I couldn’t really see evidence of the Christian faith other than fiction. When I graduated, my bowl of soup, my grades, my relationships were empty–though I shuffled out of that class with an "A" in my academic bonnet. But I was left, like Jacob, with the hypnotic, stupefied trance of his remaining hunger when he heard his spoon echo against the clanking emptiness of his bowl. I left hungry, and without an inheritance of faith. The same thing happened to me. I was at another school before Regent, and I had a New Testament class where we were supposed to read the Bible as literature. I also got very good at writing without my faith. It was dreadful. Eileen, that was part of the reason I came to Regent. I thought that inoculating myself in a Christian school would snap me out of it, but I fell deeper down the rabbit hole. Did you ever get it back? I'm sort of guilty of blending into my surrounding culture. When I was around non-Christians, I blended into their way of writing and such. When I'm around Christians, I blend well with them. And that scares me a little. Even though I do feel that my walk with Christ got stronger at Regent (in some ways...in some ways not), I'm afraid that it's not as genuine as it should be. Maybe your fear of not being genuine is exactly what makes you a genuine person. The fact that you're thinking deeply about where you are in your faith means that you're keeping yourself accountable--and that's GOOD! How many friends do we all know who are so SURE they're right all of the time? I don't know about you, but they drive me crazy. When we live our lives with that unhealthy version of confidence (arrogance) we have no room to grow or become better. I really think you're on the right track, Eileen. Are you still at Regent, now?